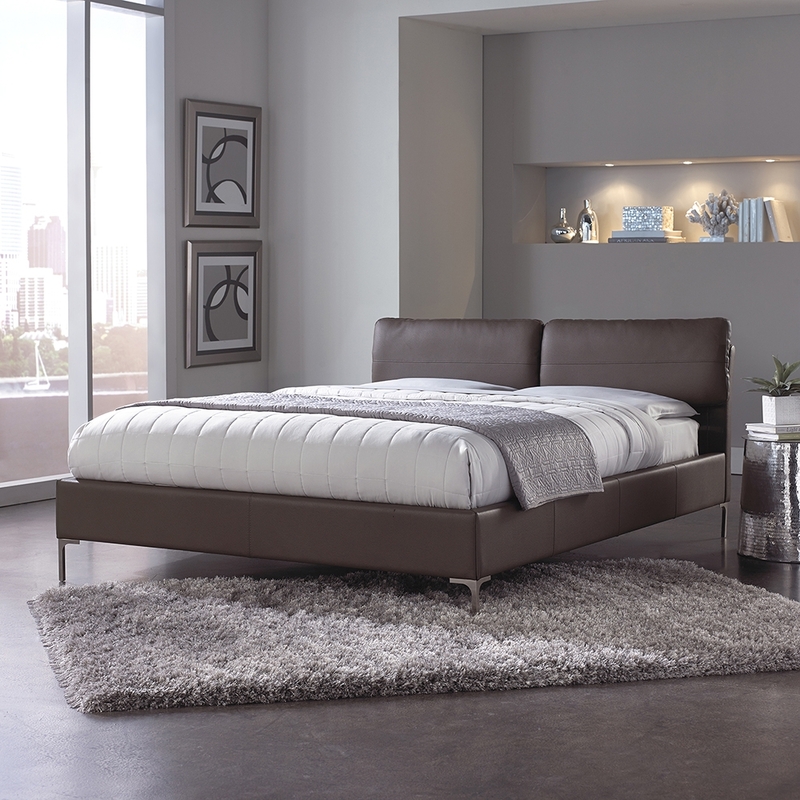 The sleek, contemporary design of the Aurora Platform Bed features a rich Greige color faux leather upholstery that enhances any room’s décor. The two headboard cushions are adjustable, providing excellent seating comfort for working, watching TV, reading, or just relaxing in bed. They are easily attached or removed with Velcro attachments. 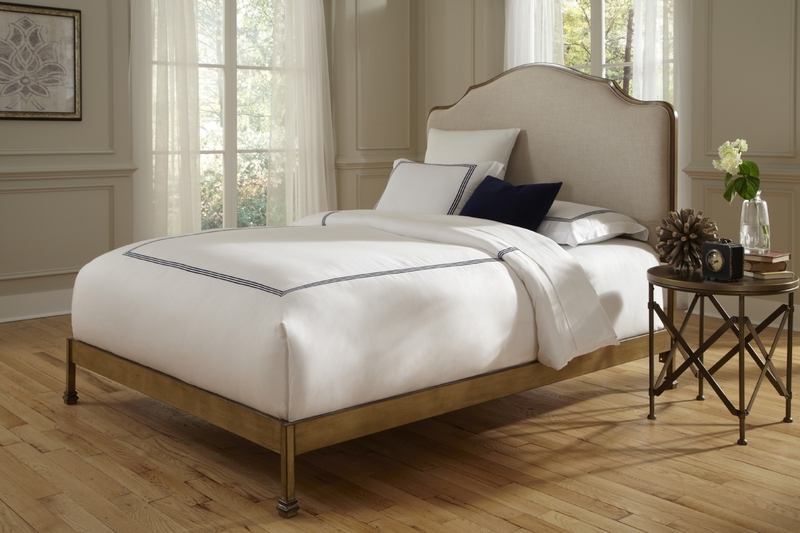 This bed features soft lines and luxurious material that creates the perfect setting for rejuvenation. The Aurora is available as a complete bed in queen, king and Cal king sizes. The Avalon Canopy Bed offers a whimsical retreat for a sophisticated bedroom setup. Sleek and contemporary the headboard is upholstered in a stunning Platinum fabric, which is echoed on the footboard of the bed. The side rails and the canopy feature a clean, simple Slate finish that adds an extra touch of class. The Avalon features a Euro deck support system for use with a mattress only. The canopy bed is available in full, queen, king and Cal king sizes. The Calvados Bed is a French Country offering which blends European elegance with warm, country styling. The graceful design of the headboard welcomes you into a master bedroom or guest room which immediately says comfort and relaxation. The woven texture of the Sand colored fabric is accented by the unique, natural oak finish which is applied to the metal portions of the bed. This look fits well in both country homes and more stately residences. The Calvados is available as complete bed with side rails and slats or as a headboard only in queen, king and California king sizes. The coexistence of wood and fabric make the Delano Platform Bed an intriguing addition to any bedroom. The wood features a Washed White finish that contrasts nicely with the dark Pewter panels for an eye-catching and unique feel. The straight lines of the bed are complemented by the gentle curve of the sleigh-style headboard. 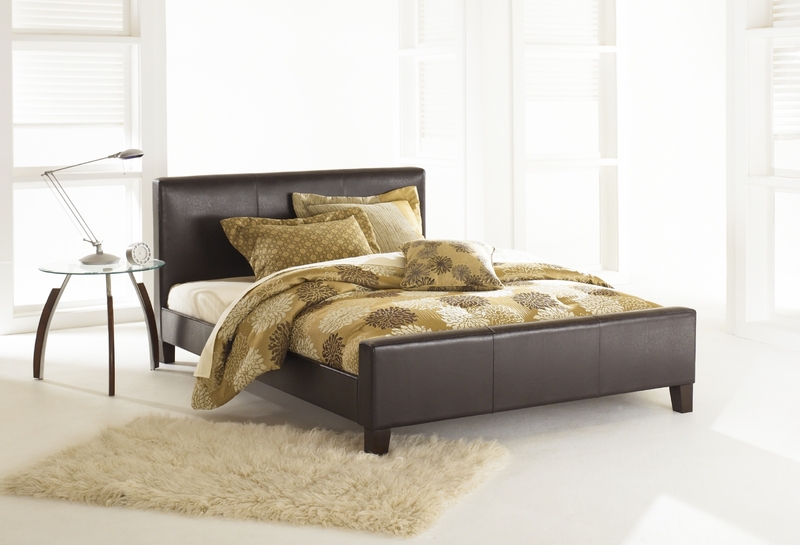 The Delano will certainly be a statement piece in any master or guest bedroom. It is available in queen, king and Cal King sizes. The Euro Bed, with its sleek European-style platform, is a fashionable option that would easily fit in a modern, uptown loft, but could realistically work anywhere. The soft yet durable synthetic leather material adds sophistication to the design and the pure black color retains a classical simplicity. The unpretentious 30-inch headboard and low-profile footboard showcase your minimalistic approach. Also available in sable (brown) and white, this bed frame does not require a box spring. 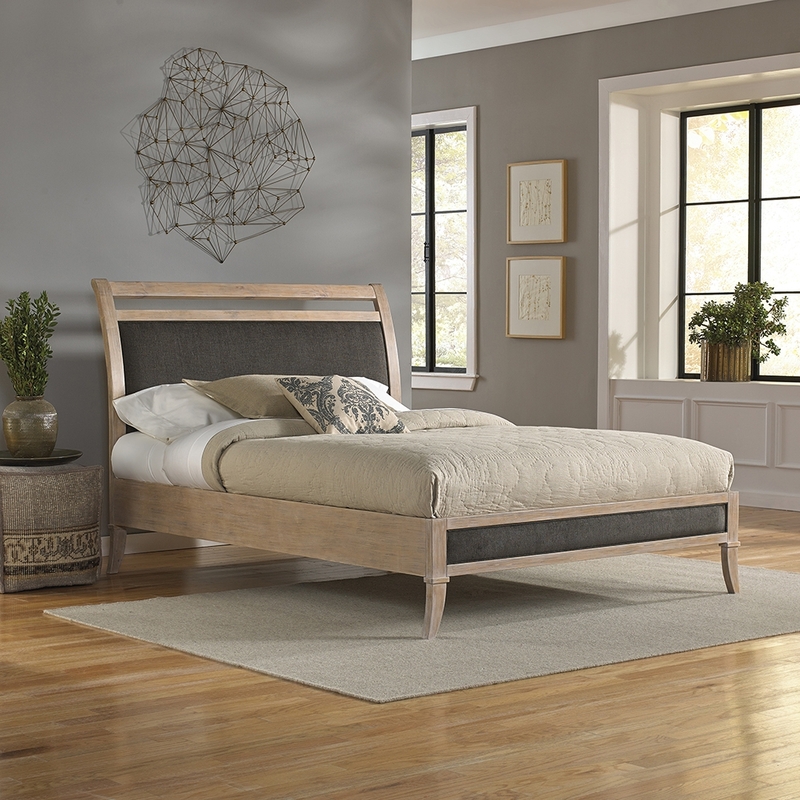 The Euro Bed, with its sleek European-style platform, is a fashionable option that would easily fit in a modern, uptown loft, but could realistically work anywhere. The soft yet durable synthetic leather material adds sophistication to the design and the pure white color retains a classical simplicity. The unpretentious 30-inch headboard and low-profile footboard showcase your minimalistic approach. Also available in white and black, this bed frame does not require a box spring. The Jakarta’s contemporary, slightly Asian style fits perfectly in today’s modern surroundings. Available in two finishes, Black or Mahogany, the headboard’s top rail has a slight curve and straight spindles, giving it a clean, geometric look. 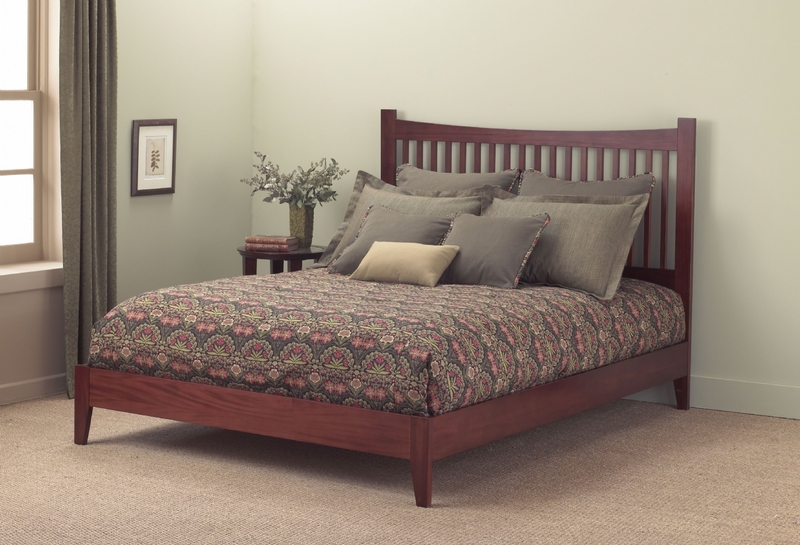 The versatility of this bed allows use with a mattress or by simply flipping the rails – a mattress & box spring. This bed can adapt to many decors or can make a statement all on its own. The Jakarta’s contemporary, slightly Asian style fits perfectly in today’s modern surroundings. Available in two finishes, Black or Mahogany, the headboard’s top rail has a slight curve and straight spindles, giving it a clean, geometric look. The versatility of this bed allows use with a mattress or by simply flipping the rails — a mattress & box spring. This bed can adapt to many decors or can make a statement all on its own.